21-Mar-2008 -- This is the first out of a series of four confluences that we visited on a 5-day trip through Northern Greece, Macedonia and Albania during the Easter Holidays. On confluence day, we landed at Makedonia Airport in Thessaloniki in the early morning hours. After a short night in the coastal town of Peräa we headed northwards to the capital of municipality of Kilkis (Κιλκίς) with a rental car. From Kilkis, the confluence is 10km to the East as the crows fly. A direct road leads to the village Koronuda (Κορωνούδα ) via the village Agyrupolis. Since Koronuda was only 1.03 km from the confluence, we decided to simply park the vehicle “in town” and walk over to the point. The village itself gave the impression of abandonment, since many houses seemed to be empty. Our walk started at an ostrich enclosure at the westernmost part of the village. When we arrived, the ostriches were very curious and came to us as close as they could. Our walk took about half an hour and was not as simple as we had thought, since there was no direct way. We had to pass around fields with young crops that could not be crossed without damaging them. The general area of the confluence allows great views to the snow-covered mountains Kerkini Oro in the North. But the exact location of the confluence is in a depression that prevents far views. It is on a small meadow exactly between two crop fields that enabled us to access the point. In 150m distance there is a noticeable building, probably a storage or warehouse. We took an easier route on our way back. There is an asphalt road 350m from the confluence that took us back to Koronuda. From there, we went back to Kilkis to have an award for our success – a latte macchiato. We then crossed the border into Makedonia and stayed the night in Strumica. Topography: hilly, high mountain ranges in the North. 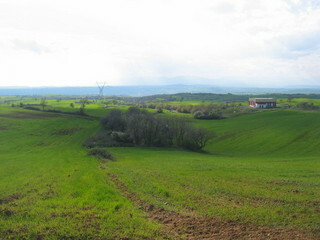 Description of the CP: In north-central Greece in an area of farmland. Flat floodplains in the South, rugged mountains in the North. Exact location in a depression between two hills. Story continues at 42N 22E.